COOPERSTOWN, NY (2/24/14): Cooperstown Food Pantry rode an early wave of support to victory in the battle for a new website last December, thanks to a contest sponsored by Central New York Mobile Marketing. The Cooperstown Food Pantry is a local non-profit organization sponsored by the First Presbyterian Church of Cooperstown and is operated in its entirety by volunteers. Each month, the organization provides emergency food assistance to between 600 and 700 people. This is the third year that Ms. O’Handley’s company, which designs and builds web sites, manages social media, and runs text message campaigns for businesses, has provided a free website or redesign for an area non-profit. Her previous work was for Susquehanna SPCA and Delware Otsego Audubon Society. This year, she decided to do things a little differently. “We are delighted with our beautiful new website,” said Ms Murray. “Everyone who has seen the site so far has been very complimentary”. Cooperstown Food Pantry, established in 1977, is an all-volunteer agency that provides emergency food assistance to residents of the northern portion of Otsego County. It is a member agency of The Regional Food Bank of Northern New York, and Feeding America, the largest hunger relief agency in North America. Established in 2012, Central NY Mobile Marketing provides website and mobile design and online marketing services for businesses. Those interested in notifications about future nominees for this program can contact Ms. O’Handley at Central NY Mobile Marketing. 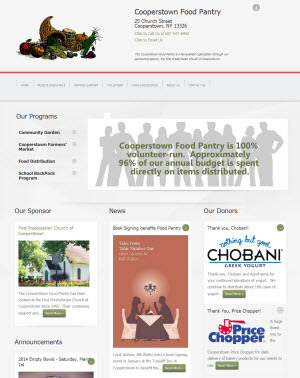 The new website can be viewed at http://cooperstownfoodpantry.org. Complete information about services from Central NY Mobile Marketing can be found at http://cnymobilemarketing.com. © 2017 Central NY Mobile Marketing, Inc.